My mother was a 30-year-old new mom when she made her first batch of Italian lemon egg biscuits. She wrapped a few in cellophane and gave them to my older brother to give to his kindergarten teacher. The story goes that the teacher called up my mom begging for the recipe, claiming they were the best cookies she had ever tasted. Since that day, my mom has baked thousands of lemon egg biscuits. Infused with lemon extract and coated with a sweet, crunchy lemon icing, these cookies are light, cakey and refreshingly citrusy. They're a perennial favorite in her Christmas cookie trays; they appear at every family birthday party; and they grace the dessert table every Easter Sunday. The kids in our family have always adored lemon egg biscuits. I grew up making them with my mom, and now she is passing on the tradition to her granddaughters. The dough is soft, springy, and easy to roll, making it ideal for children's little hands. The best part is icing and decorating the cookies. Kids love to watch the confectioners' sugar and milk transform into a smooth, creamy white, sweet icing as they stir and stir. Of course, nothing pleases them more than dipping the cookies in the icing and decorating them with loads of colored candy sprinkles. So today's post is for my nieces, Jessica and Alexandra. Girls, please ask Daddy to print up this recipe, and put it in a safe place. There will come a day, maybe in 2070 when you'll pass it on to your granddaughters. You can tell them, "This recipe is 100 years old, and it's from your Mimi who made the world's best cookies." 1. Preheat the oven to 325 degrees, and position a rack in the center of the oven. Line four large cookie sheets with parchment paper. 3. In a small bowl, lightly whisk eggs, lemon extract, oil and milk. 4. Add the wet ingredients to the dry ingredients. Using a rubber spatula, mix until a dough starts to form. Using your hands, lightly squeeze and knead the dough. If it seems a bit dry, then add 1 teaspoon of milk at a time until it reaches desired consistency. The dough should be somewhat sticky and elastic. 5. Scoop 1 tablespoon of cookie dough and roll between lightly floured palms until a smooth ball forms. Place the balls on a parchment-lined baking sheet 2 inches apart. 6. Bake cookies for 15 to 20 minutes, or until lightly browned on the bottoms. The tops will be white but cooked through. Transfer to a rack and cool completely before frosting. 7. To make the icing, whisk the confectioners' sugar and the lemon extract in a small bowl. Add a few drops of milk and continue whisking until the icing is smooth and opaque and clings to the back of a spoon. Taste and add more lemon extract and/or confectioners' sugar, if desired. When it's ready, pour icing through a fine-mesh sieve to remove any tiny clumps of confectioners' sugar. 8. For easy cleanup, place a sheet of parchment paper under a cookie rack before icing cookies. Dip the top of the cookie in the icing, then place on the rack. Decorate with colored candy sprinkles, if desired. Allow to dry completely before storing in an airtight tin or plastic container. Place waxed paper or parchment paper between layers to protect the icing and sprinkles. Properly stored, cookies should last seven to 10 days. Oh so pretty! I saw these come through on Flickr and knew they'd be special! Hey, you know this blog might still be around after we've all gone :) It's kinda creepy but cool to think about it. Anyway, they look so pretty decorated like these. I bet they taste even better too. Oh my gosh, they are so pretty! I know I've had cookies like this before, and they ARE truly the best. I have got to make these, pronto, if not for Easter (we have so many desserts already!) then for our wonderful neighbors. Thank you for sharing this special family recipe with us! I have printed your recipe and added it to my "must try for easter" baking list! Thanks they really look and sound yummy! My Mom still makes these every Easter and puts the rainbow sprinkles on too, lol. She also makes pepper biscuits and almond slices. Those are fabulous little biscuits that I adore! Yours look so pretty! My family buys a cookie similar to this from the local Italian deli but why should we buy them anymore if I can make them? They look fantastic. I love the idea that someday they will have been passed down for more than a hundred years. I can see why these cookies would be so adored Susan. These cookies are so cute! What a great family recipe too. Lemon cookies are the best. I love recipes that have such treasured stories behind them! These sound delicious - and I'm sure everyone loves them! What a sweet story, and family memory! It's reading things like this that remind me why I make little treats for my girls to brighten their days. Such a sweet post. Some of my old family recipes, many hand-written, are my greatest treasures. Love your forward looking advice for Jessica and Alexandra. I'm sure I'll love these cookies. I don't even care what these taste like because they're just so pretty! Then again, they sound like they taste wonderful! My italian grandparents made thes, but we called them wedding cookies. We always made them for weddings (also easter) and dyed the icing the brides colors. Love these! Of course they were a small bit of the gigantic cookie tables at every wedding. alanna-Thanks so much! They really are special to everyone in my family. mark-That is way too freaky! mrsjenb-You're so welcome! Like I say, they're good any time of the year! tasteyeatsathome-I do too. It makes me feel closer to family when they're not near. tabletalk-You are creating memories for them that they will cherish. sagetrifle-Hand written recipes are a treasure, indeed. tanna-Thanks. I want to be sure these cookies are treasured for many more generations. paintnwiz-Really? I always thought wedding cookies were like snowball cookies that were dipped in confectioners' sugar. Don't you love the tradition of cookies at Italian weddings? Thanks for sharing! this is a recipe I would be proud to pass on to my child - although I think he's more of the eating than the baking kind of kid! I have printed this, going to treat the special people in my life this Easter too. Thank you for sharing this beautiful treat. I remember these so well! This morning I took one look at your photo and could just taste the sweet-tart frosting. Thanks for the recipe, Susan! I wound up needing WAY MORE than a few drops of milk to make the icing whisk-able. Any clue what I did wrong? Anginettes (or anginettis)! We made these cookies every Christmas. I always liked the biscuit part without the frosting and would beg my parents to leave some left plain. @paintnwiz- we make pepper biscuits called friselles but they are small and hard. I wonder if they are the same thing? 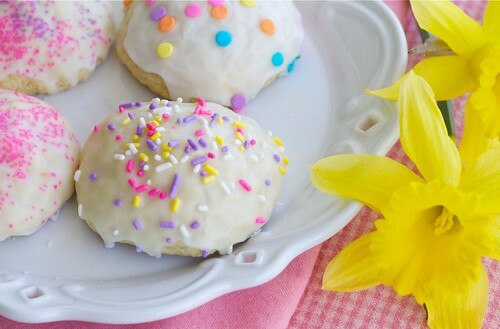 I love lemon biscuits - so much better for an Easter treat than those horrid Peeps. Pretty Easter photo. Susan.. me definitely will pass your family recipe on... probably a generation or 2 later a food reformation may occur in my country! I can't wait to try the recipe! These biscuits look so cute! I bet they are delicious too! Hi Food Blogga! My daughter printed out this recipe for me the other day and we just finished baking a batch with my grandson. He loved frosting and decorating them and we all loved eating them. This recipe is a keeper. Thank you! rose-I really am so happy to hear that. Happy Easter! anonymous-Nothing went wrong. My mom always just added milk a few drops at a time until the proper consistency was reached. You don't add it in large amounts b/c if it's too liquidy then you have to keep adding more conf. sugar. katiez-Yeah, I'm not a Peeps fan either. gattina-What a sweet comment. Hugs back to you! sari-They really are delicious. Thanks! virginia-You just brought a BIG smile to my face. Thank you! NLavalle-Your sister's wedding? I'm honored, and my mom will be too! Thanks, and please keep in touch. We make a form os these without icing and form them around a washed raw egg in it's shell. The eggs bakes with the easter cakes. We use butter instead of oil to make them rich with tradition.